The anti-inflammatory diet focuses on minimizing inflammation, which is at the root of many chronic diseases. Here’s a robust anti-inflammatory foods list. Inflammation is your body’s natural reaction to an intruder. You get a splinter in your finger and the area around it gets inflamed because your body’s defenses rush to the site to isolate the invasion and promote healing. In this example, your immune system is working as it should. But when your immune system is overactive it can cause unproductive inflammation that, if left unchecked, can lead to disease. Chronic inflammation can play a role in everything from Alzheimer’s disease, many cancers, and type 2 diabetes to heart disease, arthritis, asthma, and a whole host of digestive problems. YOU MIGHT ALSO LIKE: Is Inflammation the Root of All Disease? Many things — stress, smoking and exposure to other environmental toxins, not exercising, genetic predisposition, and dietary choices — are all potential sources of chronic inflammation. The anti-inflammatory diet teaches you how to eat in a way that minimizes this response, thereby reducing your long-term risk for disease, especially if you’re over 60. The diet was developed by Andrew Weil, MD, a Harvard-educated doctor and pioneer in the field of integrative medicine, and founder of the University of Arizona Center for Integrative Medicine. Although not specifically designed for weight loss, many people following the diet will naturally lose weight. Stabilizing blood sugar by eating low-glycemic-load meals (foods that don’t cause your blood sugar to spike), eating lean protein, healthy fats, lots of fiber-rich fresh fruits and vegetables, and drinking lots of water, all contribute to increased metabolism, helping your body burn fat rather than store it. There are no specific meal plans for this diet, rather there are recommendations for foods that should make up the majority of what you eat, and foods to avoid. Generally, your diet should be made up from fresh (not processed) food as much as possible. Fast food should be minimized and fruits and vegetables maximized. Distribution of calories should be 40 to 50 percent from carbohydrates, 30 percent from healthy fats, and 20 to 30 percent from protein. 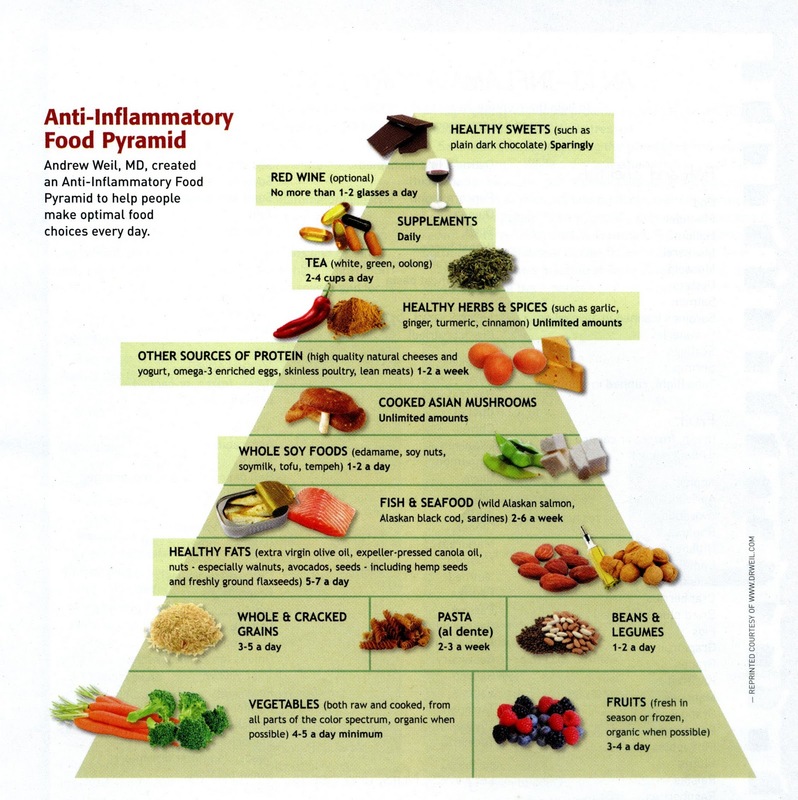 Weil uses an Anti-Inflammatory Food Pyramid to guide you more specifically about what and how much to eat. Fruits and vegetables. At the bottom of the pyramid, making up the bulk of the diet, are fruits and vegetables. Weil recommends four to five servings a day of vegetables, and three to four servings a day of in-season fruit, both preferably organic, because they provide flavonoids and carotenoids that have both antioxidant and anti-inflammatory properties. Grains and beans. Whole grains (3 to 5 servings a day), beans and legumes (1 to 2 servings a day), and pasta (2 to 3 times a week) make up the next level of the pyramid. To help minimize blood-sugar spikes, low-glycemic-load (LGL) carbohydrates should be the bulk of your carbs. Grains should be intact or in a few large pieces. Do not eat whole wheat bread or other products made from flour. Beans and legumes are another LGL food and are rich in folic acid, magnesium, potassium, and fiber. Cook pasta al dente to maintain its LGL properties. Healthy fats. The recommended 5 to 7 servings per day of healthy fats can include extra virgin olive oil (EVOO), expeller-pressed organic canola oil, walnut, hazelnut, and other oils, nuts, avocados, and seeds. The goal here is to consume fats that are rich in either monounsaturated or omega-3 fats. You should do the bulk of your cooking with EVOO, which is rich in polyphenols with antioxidant activity. You are specifically instructed to avoid margarine, vegetable shortening, partially hydrogenated oils, and all products listing them as an ingredient. Fish and seafood. Two to six servings per week of oily fish — wild Alaskan salmon, sardines, herring, and black cod — are recommended for their rich omega-3 fat content, which is strongly anti-inflammatory. You are directed to take fish oil supplements containing both EPA and DHA if you choose not to eat fish. Soy. You should consume one to two servings per day of whole soy foods such as edamame, soymilk, and tofu for their isoflavones, which have antioxidant activity and are protective against cancer. Mushrooms. Unlimited amounts of Asian mushrooms — shiitake, enokidake, maitake, oyster, and wild mushrfooms (not button, crimini, or portobello) — are recommended for their compounds that enhance immune function. These should always be cooked. Other protein. High quality natural cheeses and yogurt, omega-3 enriched or organic eggs, skinless poultry, and lean meats are allowed 1 to 2 times per week. The diet generally recommends minimizing consumption of animal foods. The top five tiers of the pyramid are healthy herbs and spices such as garlic, ginger, and turmeric in unlimited quantities; 2 to 4 cups per day of white, green, or oolong tea; daily supplements to fill in micronutrient gaps and ensure you’re getting adequate amounts of antioxidants; no more than 1 to 2 glasses per day of red wine, and sparing amounts of healthy sweets such as plain dark chocolate. For meal planning ideas and other healthy-eating and -living advice, Weil’s website is a wealth of information. He has also published a number of books, including cook books that promote his anti-inflammatory principles. If you’re concerned about inflammation and its potential related health challenges, or if you’re just interested in eating in a more healthful way, the anti-inflammatory diet may be right for you. YOU MIGHT ALSO LIKE: Glycemic Load – A Better Way to Monitor Blood Sugar?